Broken or cracked plastic parts are difficult to repair. And patched up joints hardly ever remain stable. KS Tools is now offering equipment with which broken parts can be repaired easily and above all, permanently. The heart of the matter is the stainless steel staples which are fused into the broken part by means of heat. That‘s made possible by a heating rod with which the repair staples are heated up. The heated staples melt the plastic on contact which then allows them to penetrate the material. For the workshops, this cost effective repair method means they can offer an uncomplicated and lasting solution for broken and often expensive plastic components. Apart from that, the waiting time is dispensed with as otherwise a replacement part would have to be ordered. The set from KS Tools is article number 150.1035. By fusing the stainless steel staples into the area around the break, the broken pieces are directly joined together again; similar to stitching with a strong thread. This „reinforcement“ creates a resilient joint in the plastic part which does not compromise the flexibility of the component. The stainless steel staples also have the advantage that they don‘t rust. With other repair methods, the seam breaks again all too easily. That‘s because glued or welded plastic create only a brittle connection. 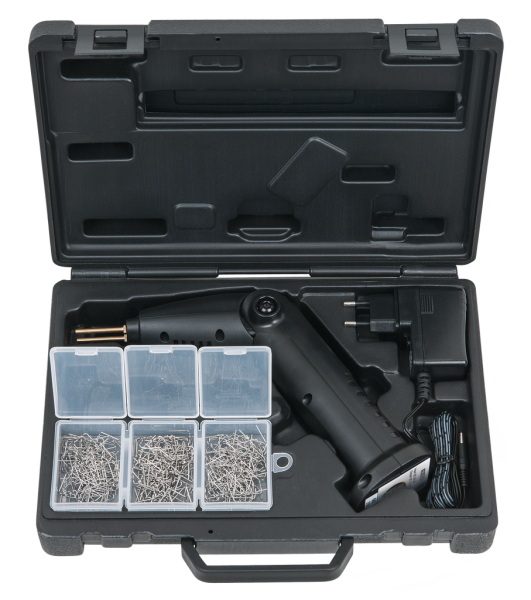 The plastic repair set from KS Tools is suitable for repairing cracks and other damage in parts upwards of one millimetre thick. A battery powered heating rod and various repair staples are the basis for differently shaped parts. The heating rod heats the clamped staple which is then pressed into the damaged plastic like a branding iron. The ends of the staples are subsequently nipped off with wire cutters and filed back. Later, the mechanic only has to sand, apply smoothing filler and touch-up paint. The result: a strong yet flexible joint. Because the flexibility of the wire prevents it breaking. 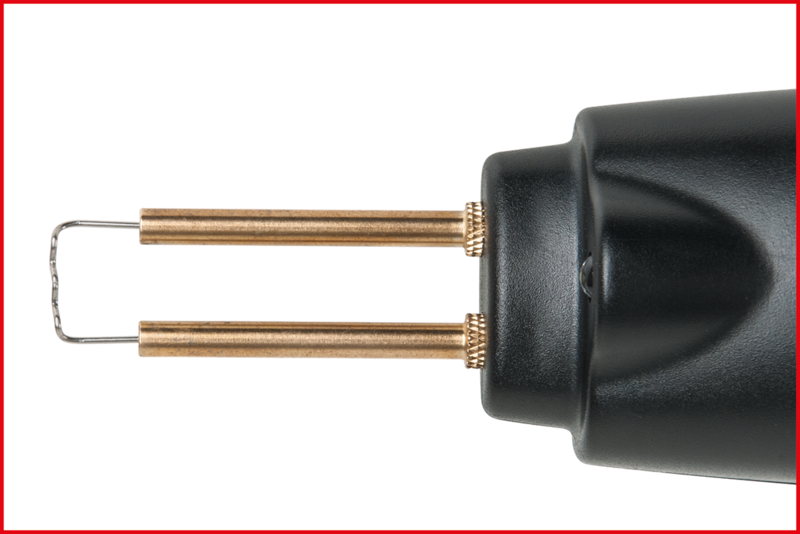 The heating rod can be both battery operated and mains powered. 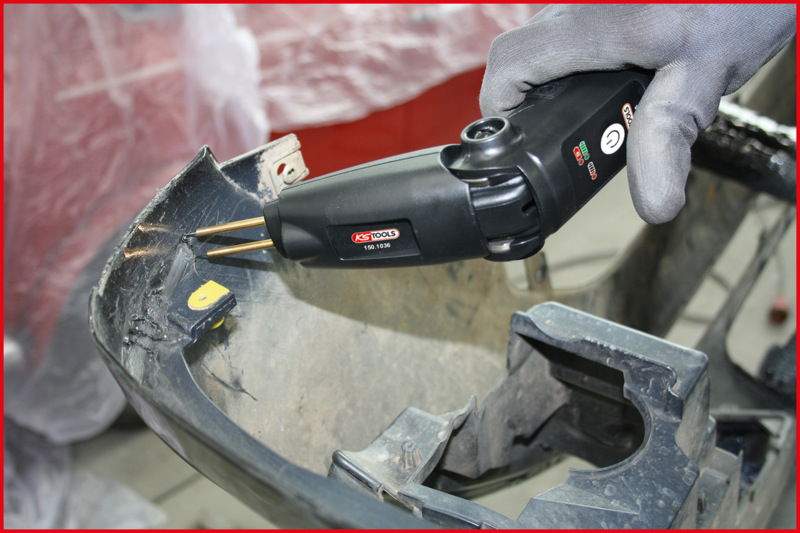 This method of stapling can be utilised for virtually all plastics and applications such as repairing bumpers and headlights, fixing small cables and hoses, broken off plastic parts of all kinds, brackets and much more. 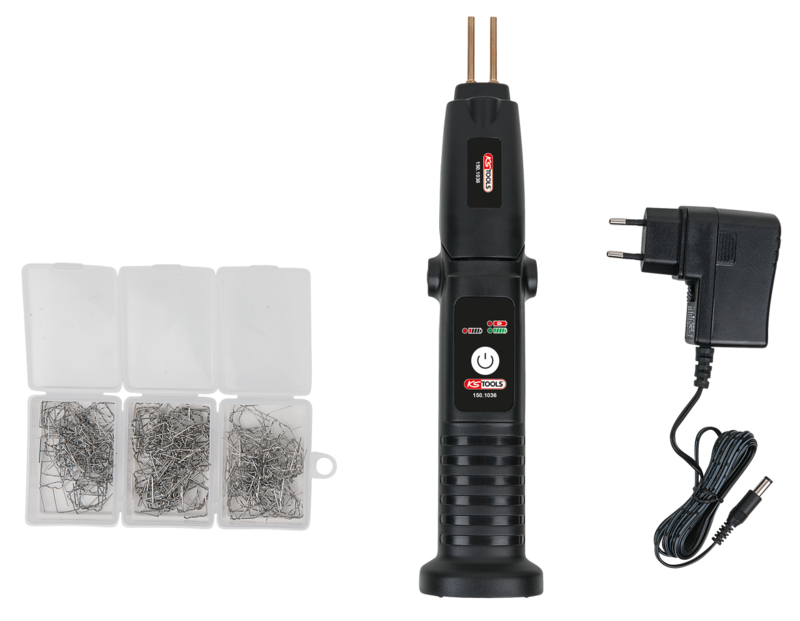 The equipment is very easy to handle and can do around 150 staples with one battery charge. The heating rod can also be kinked to enable working in difficult to access places. It can accept repair staples between 0.6 and 0.8 millimetres thick and heat up to a maximum of 200°C. A bright light provides good illumination over the entire working area during the plastic stapling. The 302 piece assortment includes the following parts: a base unit with the appropriate mains adapter charging equipment and one hundred each of U-form 0.6 mm, U-form 0.8 mm and V-form 0.6 mm repair staples. Other staple types can be supplied optionally.